We recently did an entertaining tasting event at work. Being a produce manager my selection to choose from is quite extensive. There are so many things I could have featured. At a meeting before the event someone had mentioned cranberry sauce. That started the gears in my mind turning. I thought it was a fantastic idea. So many people automatically reach for the canned cranberry sauce on the shelves they have no idea how easy and flavorful homemade cranberry sauce can be. The result were show stopping and fabulous! We had people coming back four and 5 times. By the end of the evening we sampled out over 400 bites and had received rave reviews from everyone. Because of the volume of samples we presented costs and time available for prep were kept in mind. If I were to make these at an event I hosted in my home I would have chosen phyllo cups as the vehicle for the bites. This is a three step appetizer so planning ahead is essential. Rinse cranberries and place in a large bowl. Heat syrup or honey and water in a small sauce pan just until warm. Pour the syrup over cranberries when warm. You do not want the syrup too hot as you do not want the cranberries to pop. Allow to cool. Cover and let the berries soak in the refrigerator overnight. Drain cranberries in a colander. Place sugar in a large bowl or baking dish. 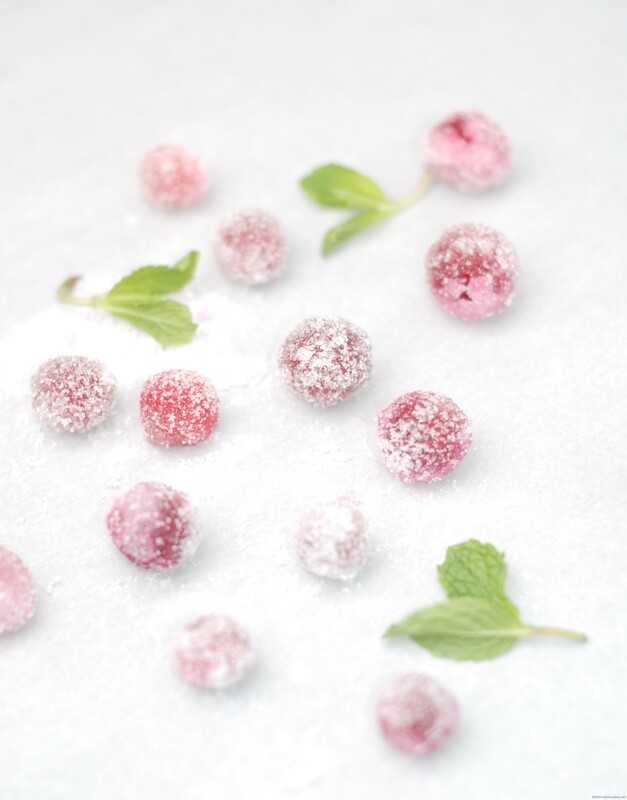 Add cranberries in small batches and roll around until lightly coated in sugar. Place on a parchment lined baking sheet until dry, 1 to 2 hours. When dry the berries have a nice crunchy candy coating. Place all the ingredients in a small pan. Cook on low – medium heat, stirring occasionally. As they heat up, the cranberries will pop open. You know the sauce is done when 90 % the berries have split open. 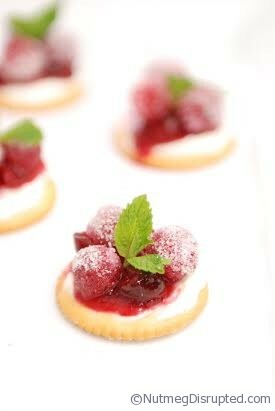 Spread the crackers with the cream cheese, add a teaspoon of cranberry sauce, and 4 or 5 sugared cranberries. Garnish with fresh mint sprigs. I don’t think the cranberries will fair very well. I think when they are thawing the covering will become very wet. Do you think these would freeze well in a tart shell? Or would the candied cranberry collapse? These are cute, and I bet they are tasty too! These look beautiful! I probably would come back 10 times for them! Pinning it, thanks for sharing ! Pinning this one! I know I’ll use it over the holidays. 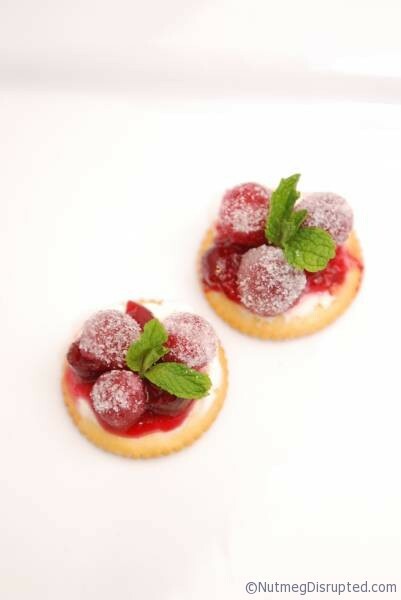 Who on earth wouldn’t like these little bites?! It’s hard to go back to the canned stuff once you’ve had cranberry sauce made from scratch! My biggest problem with fresh cranberries is that I’m always tempted to bake with them and leave myself without enough to make sauce! Love them! We’ve just bought a bag of fresh cranberries and guess what we’re going to make 😉 ! Thanks! They were really quite perfect. Many were commenting that they had never had a sweet appetizer before. I did not have one person that did not like them. It was a bigger hit then I ever had anticipated! These are so pretty, Redawna! 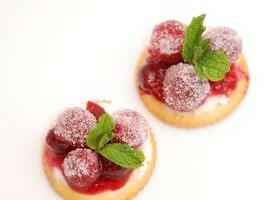 I love the combination of tart and sweet that cranberry dishes offer. With the cream cheese and a crispy base, this is the perfect appetizer!